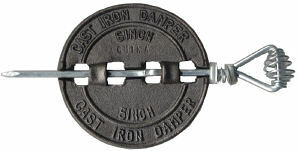 This damper helps control heat while cooking or at night. Reversible, positive but easy lock. Diamond point, easy to install. Plow steel spring, steel rod, heavy grey iron plate. Plated steel coil handle, black japanned handle yoke. Plated steel ferrule. Locked or unlocked with 1/2 turn of rod. 24 gauge, black cast iron.